The white grape variety comes from France. There are around 120 Synonyms, which are based on age and worldwide distribution in most wine-producing countries point out. The most important alphabetically grouped by country are Clevner, Clävner ( Alsace ); Arboisier, Arneau Blanc, Arnoison, Aubain, Aubaine, Auvergnat Blanc, Auvernat Blanc, Auxerrois, Auxois, Beauneois, Blanc de Champagne, Chardonnet, Chaudenay, Chaudent, Epinette, Epinette de Champagne, Gamay Blanc, Gentile Blanc, Luisant, Melon à Queue Rouge, Melon Blanc, Melon d'Arbois, Melon d'Arlay, Morillon, Morillon Blanc, Noirien Blanc, Pinot Blanc Chardonnay, Pinot de Bourgogne, Rousseau ( France ); Yellow Burgundy, Klawner, White Ruländer ( Germany ); Chardonnay Bijeli ( Croatia ); Obaideh ( Lebanon ); Wais Edler, Waiser Clevner ( Moldova ); Morillon, Pinot Blanc Austria ). It may, despite seemingly suggestive synonyms or morphological Similarities do not match the varieties Aligoté. Auxerrois (Beaunois) Melon de Bourgogne. Pinot Blanc (very similar), Sacy or Traminer (Savagnin Blanc). 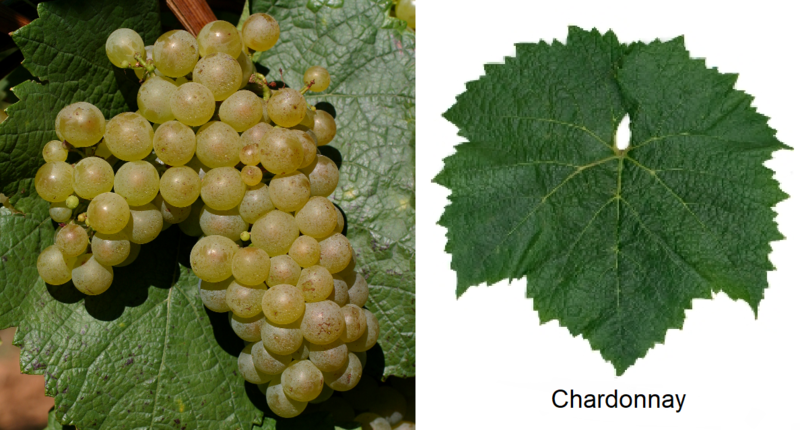 By the end of the 19th century, Chardonnay and Pinot Blanc were often confused. The Ampelographer Victor Pulliat (1827-1896) had already emanated in 1868 from two different varieties and this was at least in France in 1872 officially recognized. In other countries, problems had been going on for much longer and the two were considered identical. In Austria, they were registered and expelled together until 1999 in the official grape variety lists. Only in 1999 DNA analysis Finally, the autonomy was confirmed: Chardonnay is a natural cross between Gouais blanc x Pinot, In the Austrian Styria Chardonnay is traditionally called Morillon referred to and often considered as independent. 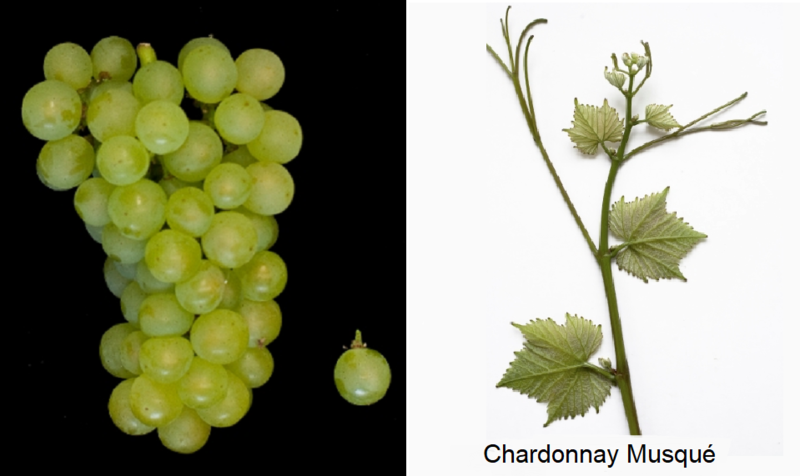 Although this vine has slight morphological differences with Chardonnay, it is genetically identical. The variety was first mentioned under Beaunois in 1583 in the department of Saône-et-Loire, but it could also have been meant Aligoté. A reliable name under Chardonnet took place in 1685. The current main name is after the Burgundian community Chardonnay ( Mâconnais ) have received. The Roman Catholic Order of the Benedictine and Cistercian In any case, they have spread the variety throughout Europe. The early ripening vine is very sensitive. She is prone to real mildew. Botrytis. yellowing or. Flavescence dorée. Verrieseln and millerandage, The variety is obtained from white wines with a variety of hazelnut, marzipan and butter flavors oxidation tend. In France there are about 30 recognized clones (see Dijon clones ), some of them earnings and susceptibility to disease are quite different. In France, the variety is immensely popular and successful. The acreage increased six-fold from 7,325 hectares in 1958 to 44,593 hectares in 2010. She's behind Ugni Blanc ( Trebbiano Toscano ) the second most common white grape. The largest quantities are in the Burgundy (33%), Languedoc-Roussillon (27%) and Champagne (21%). All major Burgundian white wines are obtained from this grape variety. These are the areas above all Côte de Beaune (southern half of Côte d'Or ) with the world famous appellations Aloxe-Corton. Meursault and Montrachet, such as chablis and Mâconnais, Likewise, all are called "Blanc de Blancs" champagne made from Chardonnay and in the champagne cuvées this is the most important grape variety in addition to the red varieties Pinot Noir and Pinot Meunier, Once a year there is the competition Chardonnay du Monde in the Burgundian town of Chaintré. In Italy a total of 19,709 hectares are planted with it. Here the variety is mainly in the regions Trentino-Alto Adige. Lombardy. Apulia and Sicily grown. Other countries in Europe or North Africa are Belgium. Bulgaria (2,457 ha), Germany (1,228 ha), England (235 ha), Georgia. Greece (586 ha), Israel, Croatia (668 ha), Luxembourg (16 ha), Malta. Moldova (5,134 ha), Austria (1,431 ha), Portugal (803 ha), Romania (1,067 ha), Russia (1,981 ha), Switzerland (321 ha), Slovakia (310 ha), Slovenia (1,208 ha), Serbia. Spain (6,958 ha), Czech Republic (766 ha), Turkey (142 ha), Ukraine (2,985 ha), Hungary (2,757 ha) and Cyprus (128 ha). In California From the 1980s, there was a Chardonnay boom that continued around the world. Here it is the most common grape variety with 38,555 hectares. Other US states with smaller quantities are Idaho. new York. Oregon. Texas. Virginia and Washington (3,098 ha). Other countries are overseas Argentina (6,473 ha), Australia (27,773) Bolivia. Brazil (377 ha), Chile (13,082) China (738 ha), India. Japan (602 ha), Canada (1,178 ha), Mexico. Myanmar (1 ha), New Zealand (3,911 ha), Peru (1 ha), South Africa (8,278) and Uruguay (149 ha). The variety occupied in 2010 a total of 198,793 hectares of vineyards. Compared to 1990, at that time 69,282 hectares, this amounted to about three times the amount. She thus ranked 5th in the worldwide grape variety ranking. This page was last modified at 21 April 2019 at 16:12.